needed -- for a while now. And while you might have a favorite shop to cop your goods at, there are always other options -- especially if you’re looking for variety in oils, vapes, flowers, edibles, and everything else in between. From farm-to-bowl boutiques and sleek pharmacy experiences to high-tech speakeasy-like lounges, these 10 dispensaries epitomize the recreational cannabis scene in San Francisco and will make sure you leave a very satisfied customer. 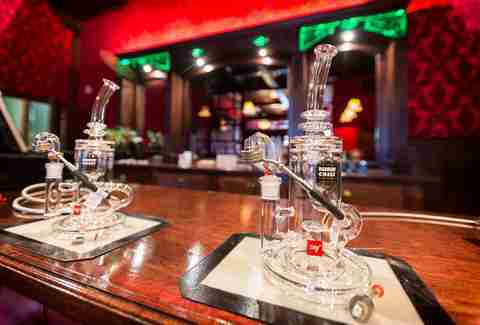 The home of the East Bay’s top dab bar and vapor lounge also features a knowledgeable staff of budtenders and a showroom that also serves as a venue for wellness counseling, classes, support groups, and social events. Be sure to check out their monthly cannabis farmers market where notable California cultivators provide demonstrations and deals and activists such as The Waldos, the originators of 4/20, and advocacy icon Ed Rosenthal have served as speakers. With products on the shelves like Cannabis Quenchers CBD lozenges to Mary's Medicinal transdermal gel pens, Magnolia offers plenty for both social smokers and ailment-focused patients alike. Described in the pages of High Times as a “steampunk-themed cannabis club designed by a Burning Man artist,” the vibe of Urban Pharm is unlike any other smoke spot. Take advantage of both the in-house dab bar and the open-flame permitting that allows you to fire up that newly-purchased fire sativa from Fig Farms. Urban Pharm also hosts a weekly comedy night on Tuesdays. Here’s to hoping those edibles kick in at the most humorous (or, hell, even the least humorous) moment. It just wouldn’t be SF if a weed shop didn’t sport some insane level of technology to view your bud. Therefore, Medithrive has a camera with a macro lens displaying flowers on a 4K monitor for optimized #nugporn glory. There’s also a strong mix of health and wellness products like Canndescents calming and creative vape cartridges or Releaf capsules from multi-time Cannabis Cup topicals winner Papa & Barkley. Swap bud for tech, and this sleek space could easily be an Apple store. You’ll get the same care you would from the Genius Bar, and you can be sure that each product has been through rigorous testing for purity and strength. 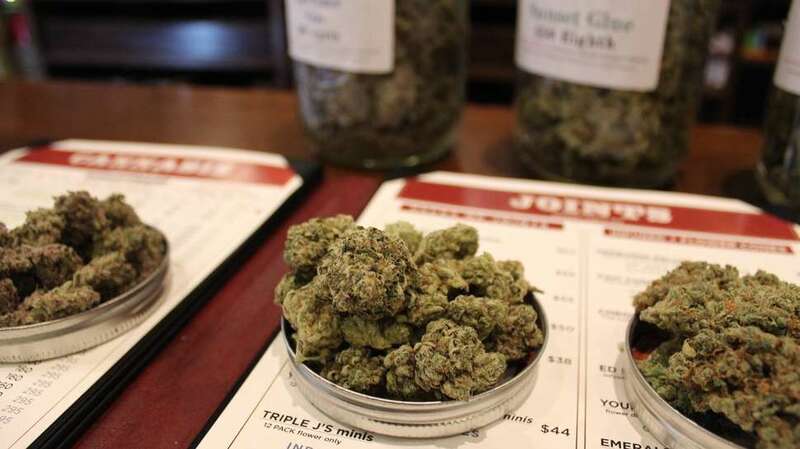 Peruse the extensive menu from a big screen behind the counter if you know what you’re after, or rely on the patient and knowledgeable staff to walk you through the offerings and explain the difference between the strains. Products range from home-grown flowers to the famous Dolores Park truffles, once hawked by San Francisco’s most beloved pot dealer who’s recently taken his operation legal. That’s right, Sparc has scored the coveted Truffle Man chocolates that now come in a fancy art deco box -- a potent sign of the times. While you can’t smoke on sight, you can take advantage of the vape lounge, and becoming a member gets you access to game nights and special cannabis events. Delivery service and online ordering available. The three Apothecariums sprinkled throughout the city represent the high-end future of cannabis. 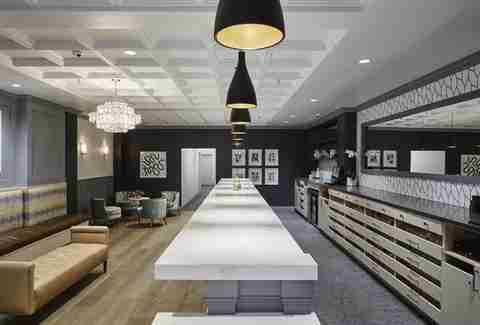 Each one recalls the lobby of a stylish, boutique hotel or extremely fancy dermatology office. The Castro location even won Architectural Digest’s award for best cannabis space in the country. If you’re looking for 1-1 consultations with a knowledgeable budtender in a location that makes you feel like stoner royalty, this is your jam. Not only do they offer impeccable service, but the organization is committed to community engagement -- it hosts education events for healthcare professionals and medical patients and has donated more than $350,000 to local nonprofits since 2011. Grams start at $11 and eighths at $25 for a “mixed melange,” and you can get a pre-roll for $7. Head there on Thursday to get 20% off select vape pens, to boot. Order online for pickup or delivery. Modeled after the Amsterdam coffee shops and recalling San Francisco’s prohibition past, this bar-like dispensary is doing its part to bring a little old SF glamor to the cannabis scene, while offering state-of-the-art smoking, dabbing, and vaping tools. The speakeasy-style shop has give-or-take a billion rules -- and if you’re there with the happy hour crowd, the staff won’t have time to tell you any of them. Here’s the deal: Once you’ve registered at the front, waited in line, signed up for its rewards program on iPads, and ordered your bud from the counter, head to the back lounge where you’ll need to check in with another host. Trade a driver's license for a pager and borrow any smoking accessories you need before heading into the haze. Here plush purple leather booths, chandeliers, and four big screen TVs await. Just when you’re getting really stoney and comfortable, your pager will start aggressively beeping at you, which means your time’s up in this magical, stylish weed haven has come to a conclusion. Exit to Mission Street between Fourth and Fifth and begin the next page of your choose-your-adventure experience. Bright, clean, and mellow with a few stools where you can hang out and partake, Bloom Room is your friendly down-to-earth neighborhood shop. The budtenders have time to offer a little more personal care and attention here and the chill vibe is a little more stoner-friendly… meaning if you’re new to cannabis, you can count on guidance and suggestions. While most joints run from $12-$32, you can sometimes score a $5 joint of shake, which is a blend of strains -- consider it the Tecate deal of weed. Join the collective and get access to community events, product samplings and demos, and even free professional massages. 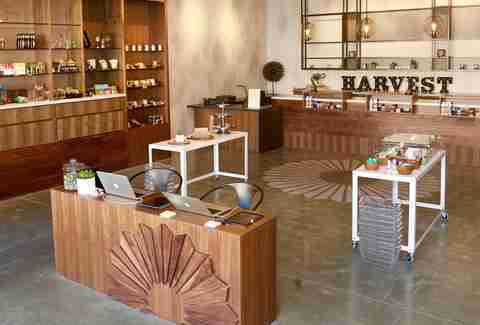 Harvest is the Whole Foods of weed shopping, proclaiming a “farm to feeling” experience with all-natural products that are independently lab tested. They even give you a hand basket while you shop, and unlike most dispensaries the products are not behind glass or a bar so you can browse like you’re in a fancy health foods store -- and with every type of organic edible, tincture, ointment, lotion, and rub you can imagine, that’s basically what this is. Join the collective and get access to the back lounge, a sleek Wi-Fi and outlet-equipped space where you can smoke, vape, or dab on leather chairs. Located on the corner of Polk and Post with a relatively late closing time (10pm), this petite, discreet storefront is prime for wild nights bar crawling through Polk Gulch -- and the lines recently mean people have definitely caught on. Like many other newly recreational dispensaries, this established collective (they’ve been offering medical cannabis for 10 years!) is still navigating the new era of heavy regulation, so lately the experience has been less consistently awesome. Sometimes they accept credit cards, sometimes they don’t (there’s an ATM on site, though). Sometimes the line stretches down, sometimes you can walk right in. And pricing has been in flux. These days pre-rolls go for around $15, but you can score a house cone for under $10 (pre-tax). What really makes this place shine though is its massive menu (which they keep updated online if you’re looking for more efficient service) and the knowledgeable, friendly staff. We love a budtender that’s patient enough to hear what you’re looking for and can offer recommendations while guiding you to the best deals and values. They also deliver. Hit more than a couple of SF’s dispensaries, and you’ll get the distinct sense that businesses in the era of regulation are desperate to shed weed’s misunderstood reputation with their crisp, white interiors and painstaking professionalism. That’s understandable -- and likely necessary -- but if you’re looking for a more relaxed scene head to The Green Cross, which while no less professional, has a small-business vibe some of the posher dispensaries lack. The blacklight, neon, and psychedelic art are a little nod to marijuana’s youthful stoner side and sets this spot apart from the pack. Pre-rolls run for $15 and the online menu noted eighths starting around $30, pre-tax. Cash only. Amy Copperman is a writer in Oakland, California, and a cannabis connoisseur. Follow her on Instagram. Gary Goodson is a cannabis writer and researcher from Garberville, California, though his years in the Emerald Triangle have been friendlier than what you’ll see on Murder Mountain.